Malta Maritime Directory :: MAPFRE/Middlesea EUROMED Regatta 2015 - Malta Wins Back Overall Title! Comment about: MAPFRE/Middlesea EUROMED Regatta 2015 - Malta Wins Back Overall Title! MAPFRE/Middlesea EUROMED Regatta 2015 - Malta Wins Back Overall Title! By Wilfred Sultana. As can be seen in the photo below, off to Sea for Glory and Fun! 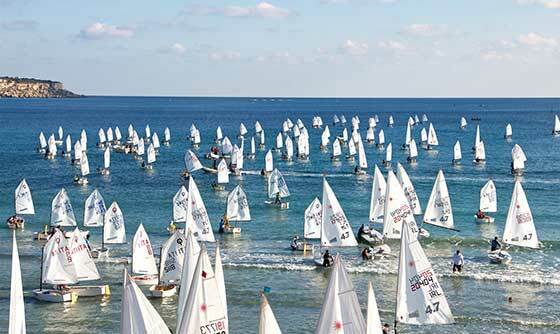 The biggest ever Euromed fleet provided a spectacular and thrilling Regatta to race or follow! The 16th edition of the MAPFRE/Middlesea EUROMED Regatta 2015 held December last was a superb and thrilling edition. A gratifying backdrop indeed - 227 sailors from 17 countries representing 55 different sailing clubs! 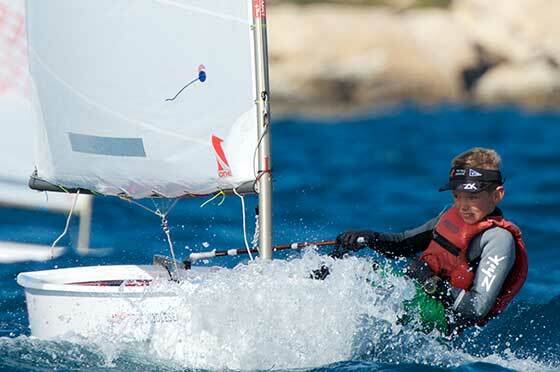 10-year-old Richard Schultheis, a member of the Malta Young Sailors Club who raced in the Cadets Class, won back the overall award for Malta after 4 editions to become the youngest of all sixteen Euromed (2000-2015) winners. In the complete winners’ listing by country Malta now prides itself of six wins, followed by Russia boasting three wins, having Italy and Sweden cherishing two victories each, concluding the prestigious sixteen winners lineup with Great Britain, Iceland and Turkey showing-off one triumph each. With regards the number of participants Italy boasted the biggest number of competitors with 78 sailors, followed by Malta with 36 sailors, the United Kingdom with 21, Ireland 20 and Russia 11 making them the top five nations out of seventeen with regards to representation. The youngest competitors at Euromed 2015 were two 8-year-olds from Italy. Maltese sailors won first place in all the three Optimist Classes – beginners, cadets and seniors – a result which came as no big surprise to Jean Paul Fleri Soler, the Malta Young Sailors Club Youth Development Officer. “International competition was high but we do have a nucleus of tenacious sailors in our group. Training and preparation over 2015 was one of the most intense and of high level for many years “. Euromed panel of International Jury comprised of Nigel Vicks (United Kingdom), Bence Borocz (Hungary), Mirko Ukas (Croatia) and one National Judge, Jovin Rausi, “were all pleasantly surprised at what a warm event the MYSC organised. In fact they all wish to return - and that's indeed a good sign”, remarked Chairperson of International Jury Peter Valentino. Furthermore Valentino welcomed the MYSC decision to adopted two racing areas, one for the Optimist Fleet and the other for the Laser boats. “Mark laying was excellently dealt with even when the wind shifted and marks needed to be moved. Turnaround of races was really good where all coaches were very cooperative” defined Valentino. 1st Daniel Ciantar (MLT); 2nd Francesco Balzano (ITA); 3rd Antonio Adornato (ITA). 1st Richard Schultheis (MLT); 2nd Marco Gradoni (ITA); 3rd Daniel Cante (SLO). 1st Craig Farrugia Vella (MLT); 2nd Andrea Milano (ITA); 3rd Demetrio Sposato (ITA). 1st Loghlen Rickard (IRL); 2nd Justin Busuttil (MLT); Karl Miggiani (MLT). 1st Salvatore Scuito (ITA); 2nd Matilda Nicholls (GBR); 3rd Zachery Zammit (MLT). Overall Winner: Richard Schultheis (MLT) who raced in the Optimist - Cadets Class. Peter Dimech, the Regatta’s Principle Race Officer, acknowledged the enthusiastic assistance extended by the usual faithful volunteers from all the sailing clubs in Malta as well as by some visitors from overseas, including International Race Officer Michal Pasik (POL). The Organisers even secured the presence of Jackie Taylor, an experienced scoring person from the UK Optimist Association, to assist with the complex scoring that such a competitive Regatta produced. Yes, this edition was truly a superb and thrilling manifestation. Furthermore the MYSC confirmed it is an inclusive club and ready to move forward in a mature and progressive way. One of the young participants was a visually impaired sailor - Certainly young Patrick Beukenholdt from the Scaling Dam Sailing Club of Great Britain was truly a brave sailor for he started and finished every race! Here one cannot fail to recognize the economic spin off that the MAPFRE/Middlesea EUROMED Regatta today generates - The foreign contingent for the event - sailors plus - made up of some 260 persons would represent 1300 bed-nights during their Malta visit - Besides when calculating other spending like car hire, extras, extra nights for parents, coaches, team leaders and even more like the ferry tickets, plane tickets and the parents/families ones that arrived early to go around the island. Indeed a very positive outlook - especially when you consider that the 191 foreign entries hailed from 16 nations - Malta the 17th nation was represented by 36 sailors. The Malta Young Sailors Club organised the 3-day event with the cooperation and support of Yachting Malta, the Kunsill Malti għall-iSport, and the Mellieħa Local Council. Euromed, with the title sponsorship of Mapfre Middlesea p.l.c., was held under the patronage of the Malta Sailing Federation. The racing arena of the 16th MAPFRE/Middlesea EUROMED Regatta was once again Mellieha Bay with the db Seabank Resort + Spa of Mellieha recognised as the official hotel of the Regatta.